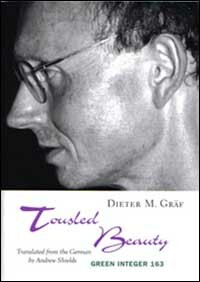 Tousled Beauty is a selection of the young German poet Dieter M. Gräf's work, emphasizing poetry, often broken and "scruffy," from before the 21st century. Many of the poems were written on the road in Europe and Asia, as well as during a stay at the Villa Aurora in Los Angeles in 1999. The poems were translated in unusually close cooperation between author and translator, with the author even revising some of the German poems in the process. "In Gräf's work," wrote Anton Thuswaldner, "language keeps its word. If an author of his caliber makes a pact with it, it goes places no one has taken it before. Such texts are expeditions." Gräf was born in Ludwigshafen in 1960 and lives in Cologne. He has published three volumes of poetry with Suhrkamp, Rauschstudie: Vater + Son (1994), Treibender Kopf (1997), and Westrand (2002). He recently edited the anthology Das leuchtende Buch. Die Welt als Wunder im Gedicht (Insel, 2004). He has received the Leonce and Lena Prize from the City of Darmstadt (1997) and has held several fellowships, including one at the Literarisches Colloquium in Berlin (1996) and at the Villa Massimo in Rome (2004). He was appointed as writer-in-residence at the Deutsche Festspiele in India in 2001 and at the Deutsches Haus at New York University in 2005.